Of all the milestones we've experienced over the past year, few have been more satisfying than dismantling the build table. The table has been around forever, a permanent fixture in the garage that took up a lot of space and got in the way of everything. Now it's gone, and we couldn't be happier about it. Taking the table apart was a simple task, but finding a place for all the wood wasn't. We're leaving it on the side of the house for now, because this is California and we're told it hardly ever rains here this time of year. We may use part of the old table to build a mock dashboard. We also thought about building a small work table out of it, although there's no place in the garage for another work table, and besides, work tables quickly fill up with tools and car parts and other junk so you can't actually work on them. And before you get all huffy about organization and keeping the place picked up, I want to remind you that it's critical to have tools and parts and other junk in plain sight so whatever you need is immediately available when you need it. Speaking of tools, our venerable Harbor Freight angle grinder stopped working in the middle of cutting out parts for the rear suspension. The motor slowed down and then stopped altogether. The thing only cost us $20, so what the heck, we got our money's worth. As we were getting ready to toss it in the garbage, we dug out the original box it came in, and were shocked to find inside a small plastic bag with a pair of new brushes. I'm not sure what was a bigger surprise, that they went to the extra expense of including a new set of brushes, or that they actually expected the thing to last long enough to need a new set of brushes. But we plugged in the new set of brushes, and darned if the thing didn't fire right up. Of course it wasn't quite that simple. It seldom is with Harbor Freight tools. When we tried to screw in the cap over one of the brushes, the cheap plastic receptacle crumbled. We had to do some minor repair work with duct tape. 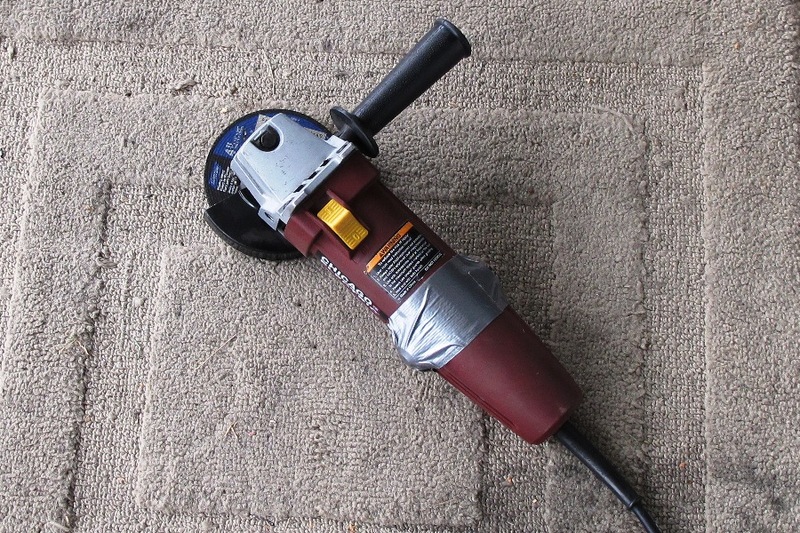 The fix worked, though, and our $20 angle grinder is soldiering on, and should continue to serve us well for a long time, or at least so long as the duct tape holds, although we're actually betting the duct tape outlasts the grinder. 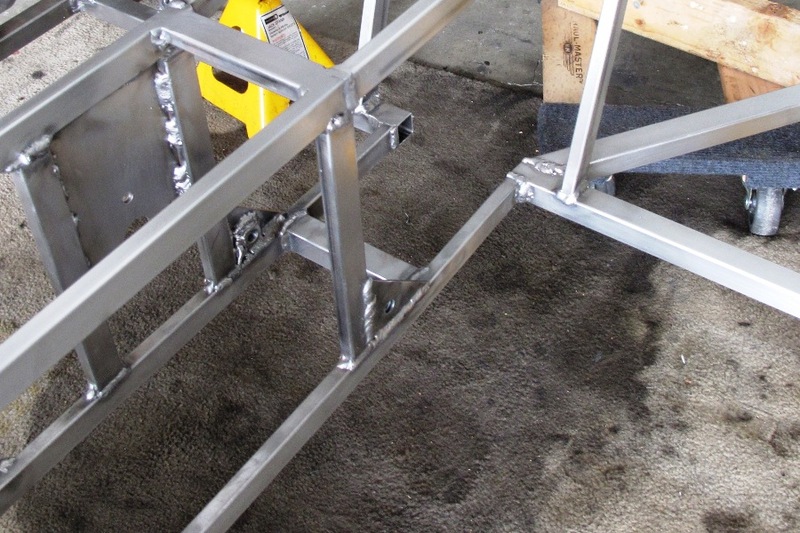 In place of a huge build table cluttering up the garage, we now have a completely bare and lightweight Locost frame sitting on two Harbor Freight dollies, which allow us to roll it in and out of the garage as needed. It's been awhile since we've been able to flip the frame on its side or over on its back, but now that we can, we took the opportunity to finish up welds on the frame's underside, and also to hit some neglected frame tubes with one of our thousands of 3M finishing pads. Per the book, we also chopped up a few frame rails that would get in the way of installing the drivetrain. We started by cutting up the A1 tube, which gets in the way of the differential flange, then we cut a giant chunk out of the C tube to clear the transmission. We also welded in an extra support on the bottom of the transmission tunnel, then, in preparation for welding in the floor, we sanded down the remaining beads on the bottom of the frame. This was something we could have done months ago, if we were at all organized. Of course waiting until the last minute has several advantages, although I can't think of what they are just now. There was a time, and not all that long ago, when we considered the floor to be an essential part of a rolling chassis. We're no longer taking that approach, in part because the giant sheet of 16 gauge steel that we ordered more than a week ago has yet to arrive, despite the fact that we paid a king's ransom for shipping. 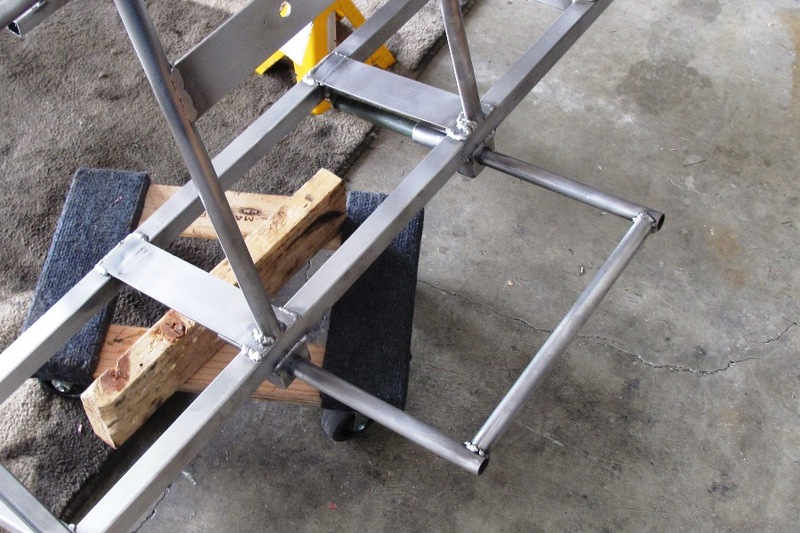 Luckily, we did have all of the parts on hand that we needed to build our adjustable spare tire carrier, so we made that instead, and maybe on balance that makes up for the lack of a floor. Probably not, though. 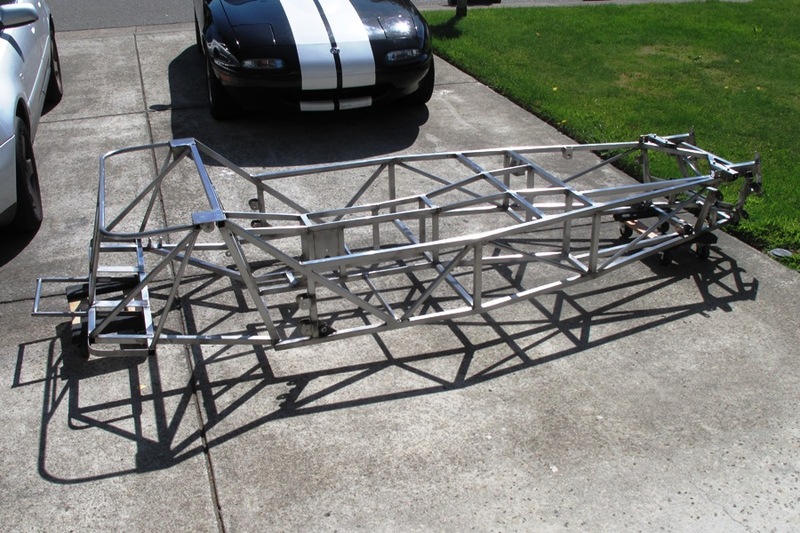 In any case we would've taken a big chance welding in the floor before test-fitting the engine and transmission. 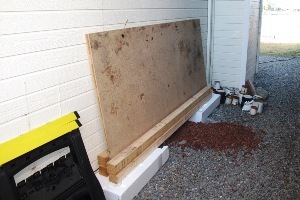 Of course we measured everything several times, and tried it all out in the mock-up frame, but it's not the same. Welding things together without test-fitting first is a direct violation of Murphy's Law of Quantum Construction, an intricate but well-established concept that basically states that if you don't test-fit a part first, you're screwed. The odds that a part will work increase only slightly with each test fitting, according to a complex formula that incorporates the natural logarithm e, pi, and the rate of expansion of the universe. So we'll test-fit the engine and transmission in the next few days, and for now we believe that dismantling the build table, finishing up all the welds, cutting the frame tubes and building the spare carrier qualifies as four steps in our rolling chassis countdown, which leaves about 20 or so, maybe less. I think somewhere between the spare tire carrier and the natural logarithm I might've lost track. But we'll go through our notes before the next meeting and come up with the correct answer. In any case, it won't be long. I've read some good stuff here. Certainly price bookmarking for revisiting. I surprise how a lot attempt you set to create one of these excellent informative site.